The Uncraftable Things Mod is a very unique mod that allows users to craft things in Minecraft that previously you have never been able to before. 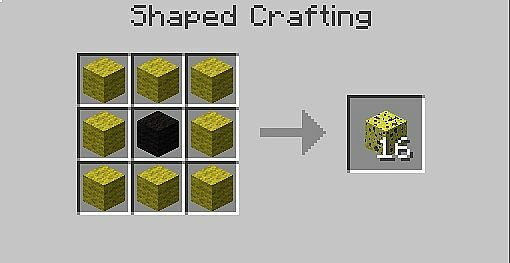 Items such as sponge blocks, bedrock, netherstars and more can now be crafted using vanilla materials. So what are you waiting for, download and install this mod today! To use the Uncraftable Things Mod you first of all need to download and install this mod with Forge. Then, once you open up your game all of the mod’s features should have already been automatically updated. The mod is currently available with Minecraft 1.8, so therefore should install very easily. With this mod you can craft all of the blocks in Minecraft that otherwise you wouldn’t be able too. Craft a music block with nether stars and bedrock. Craft a sponge block with wool. You can now craft bedrock with cobblestone and diamonds! Next, download the Uncraftable Things Mod and drag and drop the .zip files into the ‘resoucepacks’ folder. There are currently no public changelogs for the Uncraftable Things Mod. The developer released all of the features for the mod upon initial release so I can’t really see him updating the mod any further. The mod is so small that there is nothing left to add.